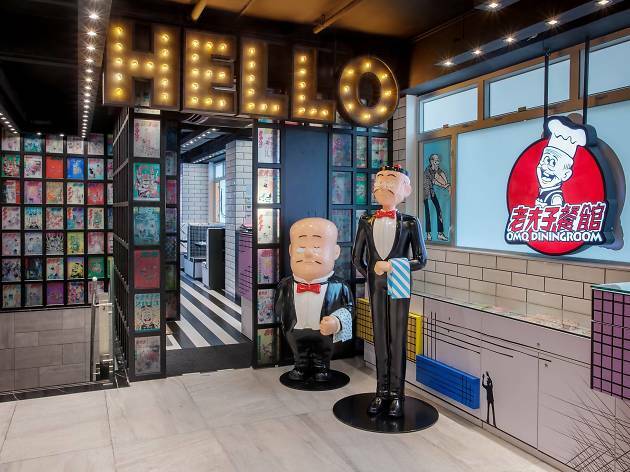 With a statue of Old Master Q dressed in a waiter uniform, greeting diners, enter the comic-themed world of Hong Kong’s most famous comic book character Old Master Q and his cast of friends in this themed restaurant. Calvin Tse, owner of OMQ Dining Room, met Old Master Q creator Alfonso Wong by chance a couple of years ago, and together they realised the lifelike world, with every detail approved by Wong himself. The dining room features a range of different artworks in either monotone, silhouette or pop art designs, but there are photo ops all around - even the chairs have been illustrated. The menu is a pretty extensive one, with soups, sandwiches, pastas and baked and grilled proteins all featuring, as well as a dedicated vegetarian section. Naturally, this too is in the shape of old mate Q.